Cleaning your Baron forced action mixer thoroughly is so important. The most popular Baron forced action mixer for resin bound aggregates is the M110 mixer. If it is your own, it is an expensive piece of equipment to replace or repair. If you have hired your forced action mixer, you do not want to lose your deposit. You should always make sure your forced action pan mixer is inspected in accordance to local rules and guidelines and that proper protection is taken throughout the use and cleaning of the mixer. Ensure the correct breathing apparatus is used. Before any cleaning commences, the power to the baron mixer should be disconnected in order to prevent any accidents. The drum of the resin mixer should never be hit with hard items such as a hammer, as this will obviously damage the drum and therefore your warranty. You should make sure that you check the drum and the mixer arm after cleaning. Adjust the mixer blades so that the distance to the bottom/side of the drum is 2-3mm. The electrical parts of the mixer should not be cleaned with a high pressure cleaner. In the perfect scenario and in order to save time cleaning the mixer at the end of the day, the mixer should be cleaned during use and in between resin bound mixes. This is to remove any excess resin and aggregate so that it doesn’t collate and stick and set to the mixer by the time you come to clean it at the end of the day. It is less of a chore cleaning as you go along than right at the end and it will also help protect your Baron M110 mixer. 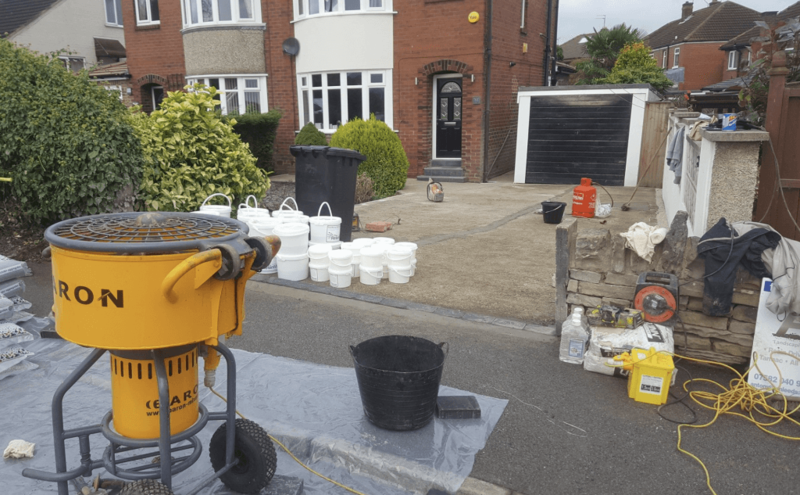 Whilst you may think the burning of resin bound mixers maybe the easiest and quickest way of cleaning out the resin, it is certainly not recommended. This is because when you decompose the polyurethane in the resin, it gives off toxic gasses such as carbon monoxide, carbon dioxide, nitrous oxides and hydrogen cyanide. Inhaling such particles can be very toxic and dangerous to yourself and to others. Don’t risk it. When cleaning the Baron forced action mixer in between mixes, the trap door should be left open in order to make sure it doesn’t seize up. Any excess resin bound aggregates can be simply removed with a sponge soaked in white spirit. The mixer is then easily wiped clean with a clean and dry cloth. It is now ready for the next resin bound mixture to be added. The full clean of your mixer should take place straight after the install at the end of the day. This is before the resin sets. If there are any aggregates left over from your installation, empty a 25kg bag of dry gravel in to the mixer and add 1 litre of high boiling point solvent such as white spirit or even diesel. Let the spirit and gravel mix in the Baron mixer for around 10 minutes. When finished, simply empty the drum and dispose of the gravel responsibly as notifiable waste. It should not be poured on the ground. If there are any tough spots of resin stuck on the mixer, you can swill further spirit round it with a wire brush. Make sure you pay particular attention to the trapdoor, safety grille, chute and grille. It is imperative for the future operation of the mixer that the trapdoor is clear of resin bound material. Ensure that you open it several times to ensure it works. It should be left open for drying. We are a Baron mixer dealership and have trade supplies of Baron mixers for sale. Find out more about resin forced action mixers. For more information please call the sales office on 01484 400 855. Speak to our friendly team who will be able to advise you on quotes and queries.